Sausalito resident Barry Hoffner was so inspired by his trip to Timbuktu, in the West African nation Mali, that he decided to celebrate his 50th birthday by launching a project, Caravan to Class. He hopes to rebuild the educational infrastructure of Tedeini, a village that he visited. Caravan to Class was formed in January, 2010, and after a couple of months of selecting an NGO (non-Governmental Organization), doing a study on the needs of the village, and putting together a budget, Barry is now in fund-raising mode. He hopes to be able to begin construction/renovation on the school by early Fall, and is looking forward to bringing his family to Mali once construction has begun. I simply had a long-time dream of getting to the famed “middle of nowhere” Timbuktu. I was told that if I was going to Timbuktu I should not miss the amazing music event, “Festival au Desert”, in the Southern Sahara Desert, outside of Timbuktu, Mali. So, I used the festival as a reason to fulfill my one of my “bucket-list” objectives. While at the festival, I decided to take a guided camel trip to a village not far from where I was camping. My host, the son of the head of the village, told me the interesting story of his people, the Tuareg, and their transition from a nomadic lifestyle to moving to the village of Tedeini. The Tuareg migrated from the Atlas Mountains in the 6th and 11th centuries to escape the Muslim invasions from the north. Today the Tuareg population numbers roughly 5 million centered around the countries that ring the Sahara Desert, mainly Algeria, Libya, Mali and Niger. 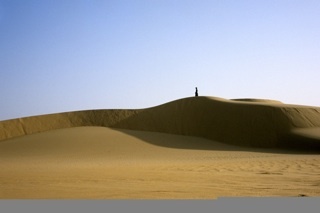 Due to desertification of former Saharan oasis and national boundary issues, many Tuareg have settled in villages and have given up their nomadic lifestyle, creating the need for permanent schools. I saw that the education of the children was suffering. Many of them were not in school, there was no longer a functioning well at the school, the teachers were uncertified, and the mud-brick buildings had deteriorated over the years. Mali ranks in the bottom five countries on the UN Human Development Index and dead last in literacy at 26%. In the villages of the Southern Sahara desert, literacy are even lower, particularly for girls. Upon returning from my trip to Mali, I launched Caravan to Class to rebuild the school for my friends in Tedeini. Mali is a beautiful place. I loved the diverse mud-brick architecture of the Mosques, the stars at night in the Sahara desert, the mysticism of the animist Dogon people, and most of all the amazing graciousness of the Tuareg, a nomadic people of the Sahara. I was personally fascinated with how engaging the Tuareg men, women, and children were drinking the ubiquitous cups of sweet/bitten tea, learning how to navigate by the star constellations, and the social customs of their culture. Although my trip was great, it was not without its challenges. In Mali, time is simply not important; there is plenty of it. Every car ride encountered multiple delays – flat tire, hit goat, over-heated radiator… However, you need to adjust and get used to that or you will simply not enjoy traveling in Africa. We departed from San Francisco on Air France, headed for Paris. We then went on to Bamako, Mali. It took 4 ½ days from Mali’s capital to reach Timbuktu, including 3 days/nights on a “pinasse” (Malian river boat) on the Niger, Africa’s third longest river. The “pinasse” trip itself was a great adventure, traveling past hundreds of small villages along the banks of the Niger, including the village where Ali Farka Toure, Mali’s most famous musician, lived (and is laid to rest). Anyone seeking a real/diverse African (non-animal) adventure. East Africa is great for those who love safaris and wildlife, but West Africa is perfect for anyone interested in the diverse and engaging African cultures. This entry was posted in Africa, Helping kids and tagged barry hoffner, caravan to class, mali, schools in mali, Tedeini, timbuktu, traveling in mali, tuareg. Bookmark the permalink.